Easy and delicious butternut squash cornbread stuffing with sweet potatoes, apples, cranberry and herbs all made in the slow cooker. 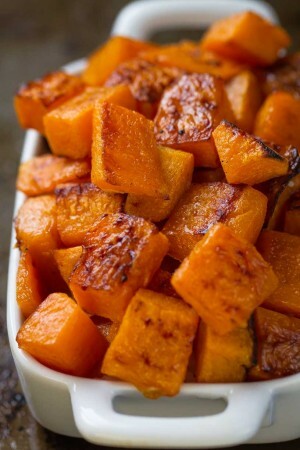 The side dishes are always my favorite part of any holiday meal. I would happily forego my piece of turkey to pile on the sides and stuffing nice and high. Remember the butternut squash cornbread I shared a few weeks ago? Well I turned that into stuffing that I made in the slow cooker. I know I know. Another slow cooker dish??? Surprise surprise. 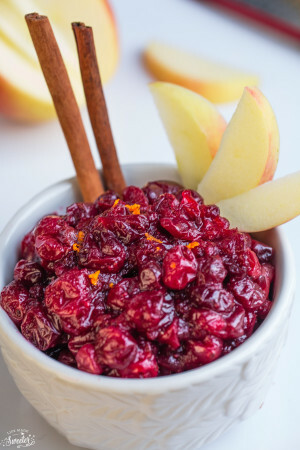 But the slow cooker has really been a lifesaver for me these days and I just want to help give you one less dish to worry about for your big turkey feast. 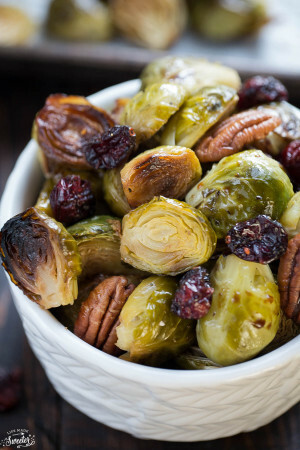 Plus, it doesn’t take up any oven or stove-top space which leaves more room for the turkey and other side dishes. 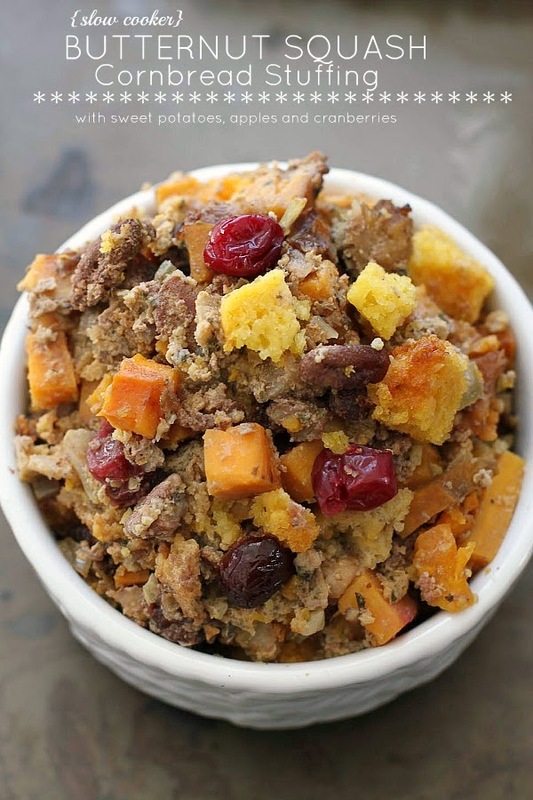 Even if you’ve already got your turkey day menu planned, this stuffing won’t take much effort. 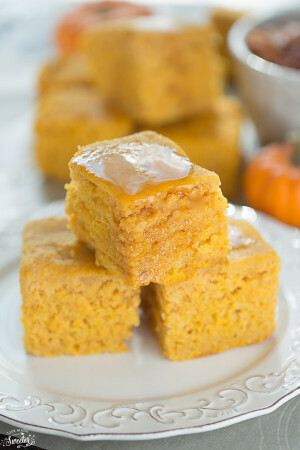 You can either use my butternut squash cornbread or your favorite cornbread recipe. 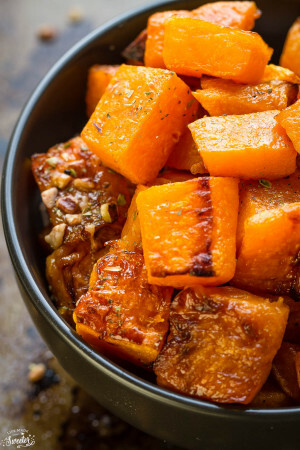 We’ll toss that into your crock-pot along with some sweet potatoes, apples, cranberries and chopped pecans. It’s loaded with lots of add-ins but feel free to leave out or swap anything for what you like. Just chop everything up and throw in an onion, some herbs, chicken broth and some apple cider and let that all cook up slowly in the crock-pot. 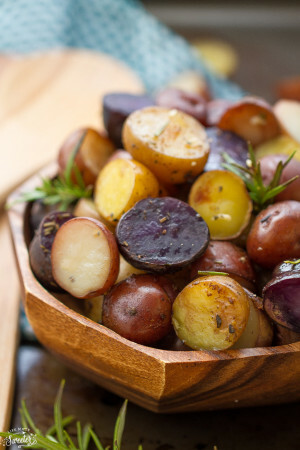 You will love how amazing this smells while the crock-pot is working its magic. Be sure to leave some room on your plate for this stuffing on Thanskgiving! 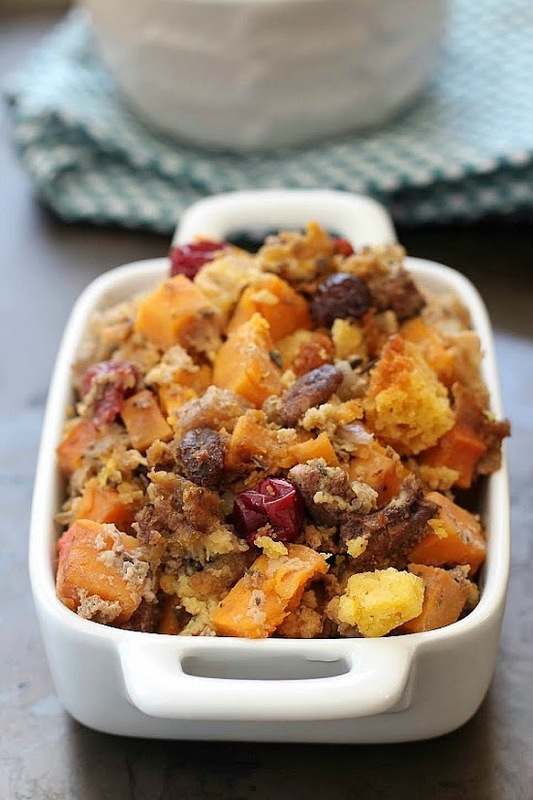 Easy and delicious butternut cornbread stuffing with sweet potatoes, apples, cranberry and herbs all made in the slow cooker. Spray inside of crock-pot with cooking spray. 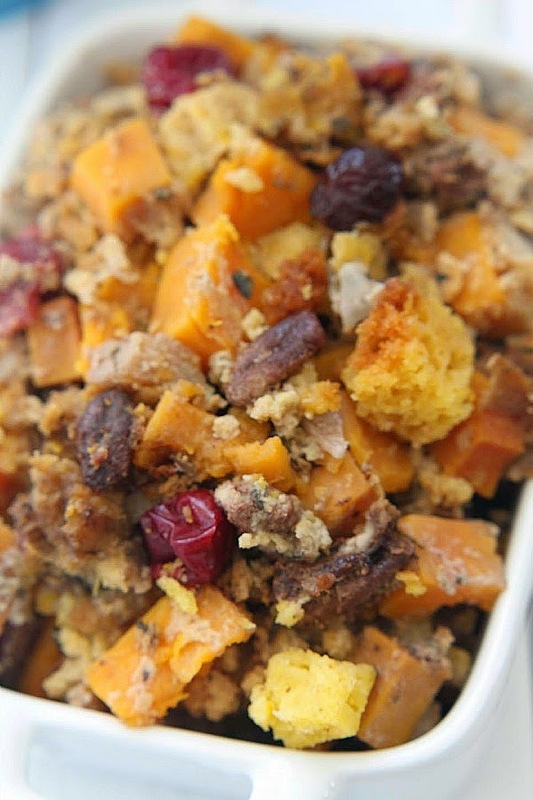 Add in the cornbread cubes, sweet potatoes, apples, cranberries, onion, pecans and dried herbs. Pour in the broth, apple cider and beaten eggs. Stir gently and place the cubes of butter on top of the stuffing. Cook in the crock pot on low heat for 2-3 hours (mine was done after about 2.5 hours or high heat for 1 - 1.5 hours. Stir with fork when finished. This stuffing has slightly crispy edges with a soft center which is how my family likes our stuffing. Add more liquid as needed if you prefer your stuffing softer. Every slow cooker has slightly different cooking times. 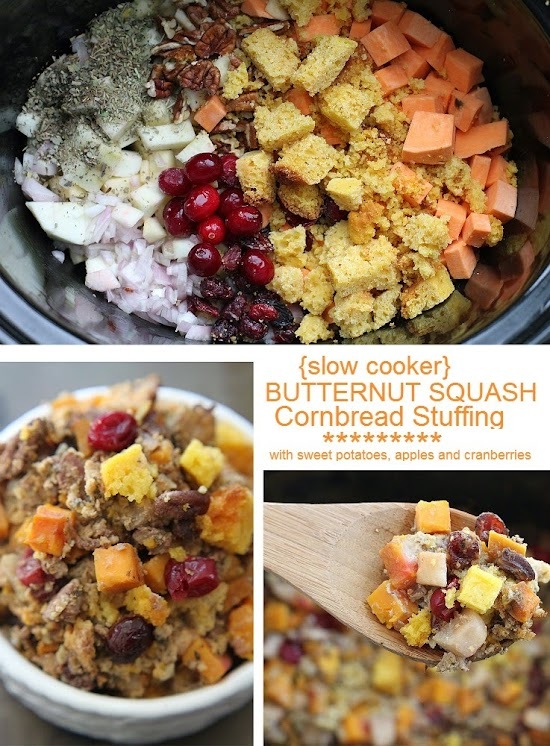 Be sure to check on your stuffing earlier if your slow cooker is more powerful or cooks faster.